Top Scottish senior golfer Stewart Henderson of Hamilton and his wife Michelle combined their talents to raise over £11,000 for C.H.A.S., in memory of young Paul Creaney who passed away five years ago. This is the fifth running of the Texas Scramble at Hamilton Golf Club in memory of Paul and it is going from strength to strength. Thirty teams competed yesterday, then enjoyed an evening of entertainment in the golf club with raffles and auctions to raise as much as possible for CHAS. Michelle also did an Arctic trek earlier in the year and raised £4,200. There is still some money to come in and hopefully CHAS will benefit to the tune of almost £12000. 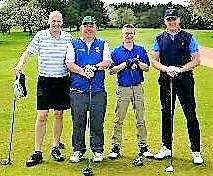 The prize-winning team, pictured right, on Sunday was W S O Sharpe, Stephen Bremner, Tom Ryan and Gordon Heaney with a nett score of 56.3, including a back nine of 28 strokes.